The last time I had driven Goldie was last Thanksgiving—for the Stockton Run for Hunger 5k—almost 8 months ago. Despite sitting outside at my friend Frank’s place (under a car cover) during all that time, she still looked good, cobwebs and all. More amazingly, after cranking over the motor several times with the spark plugs removed (to get oil circulating again), she fired up on the first try. The battery was surprisingly strong, no doubt due in part to the battery cut-off switch I had installed. Upon revival, I topped up the carburetor dampers, brake fluid (a lot of which had evaporated), air in her tires, and coolant (though she barely lost any of the latter). That was it. Frank and I also gave her a good washing. Unfortunately, she ran not very reliably at first. The first night I went to have drinks with my friend Jay in Stockton and about a mile from the bar she stalled out in an intersection and could not be restarted again. Surprisingly, within 15 seconds another Stocktonian was there to help me push her out of the intersection… good to see that there are just not punks, gangsters, and deliquents living here. I still could not start her until I pressed on some ignition wires. “Hopefully it was just a loose ignition wire,” I thought after she started. 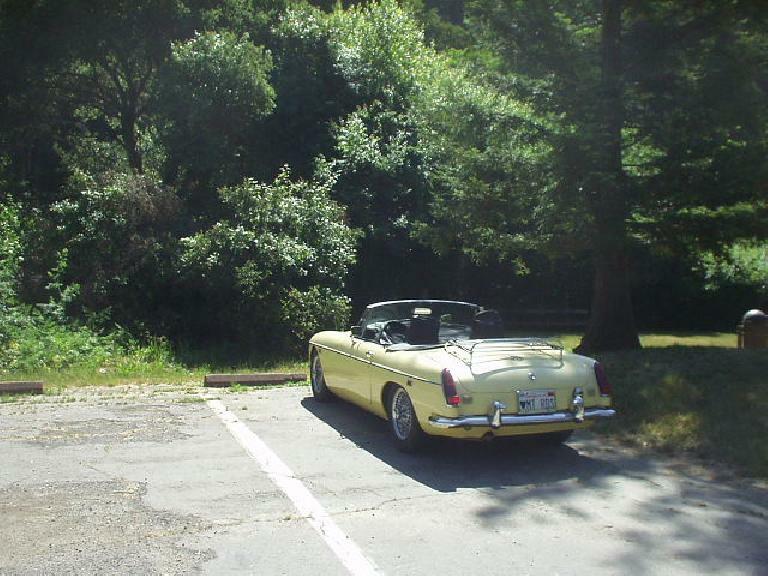 The next day I woke up at 5:30 a.m. to go run and swim with Peggy 90 miles away in Sunnyvale, and the MG ran like a champ. Later that night as I drove back to Stockton she stalled out again, in a construction zone on Highway 99… that was uncool. “Why can’t I just have a normal car,” I asked myself, shaking my head. Fortunately, I was able to restart her after a couple of minutes, and got to my folks’ place without further incident. In fact, Goldie ran much worse! As I dropped off some documents for my mom at her office, Goldie stalled in the parking lot (before I could reach a parking space, since the lot was full) and again couldn’t start. That was after running really poorly like she was only running on a few cylinders. I popped the hood, did some diagnostic work, and realized some ignition wires were badly corroded while no less than two of them had broken near their contact regions with the spark plugs and coil! That she was running at all is still amazing to me. I had spare wires (never mind they are at least 15 years old) and now she is running better than ever. Sometimes the solutions are the easiest. With her stalling and starting problem resolved, I dropped her top and happy days were here again. With the top up all of weaknesses are highlighted: rattles, no air conditioning, raucous engine, etc. With the top down she transforms into still the most fun sports car I have ever had the pleasure of driving. I couldn’t help but smile as I listened to her melodious exhaust note gurgle behind me and wind ruffled through my hair as I looked over the curvaceous front wings framing her long bonnet to the open road ahead. The featured photo of her is at Tilden Park in Berkeley, where we had fun driving through Grizzly Peak. During subsequent days between the Bay Area and Stockton she drove better than I ever remembered, even keeping her cool on days where the mercury rose over 100 degrees. Just a week ago I had openly wondered whether we would make it home to Colorado next month when we commence the drive. Now the faith is back, and so is the fun.